of a sewing machine and an umbrella on a dissection table"
Margarita Bali. Agua. Video. 1997. Sabrina Farji, Mariana Belotto. Girones. Multimedia dance. 1996. Towards the beginning of our century, a fortuitous encounter inspired Surrealism, an artistic current desti­ned to become a key referent of XXth century art. Towards the end of the century (that is, today) another encounter of similar characteristics claims our aesthetic attention. What else could video dance be than a fortuitous encounter, a product of the curious link between one of human's oldest means of expression and one of the most contemporary, an unsuspected result of the coincidence of a means personified in the materia­lity of the body with a descorporealized, abstract, almost unhuman means? Some hold that both means share the condemnation to time and movement, and that in consequence the link is legitimate. They say that the same tingle that goes through the body in the indefatigable execution of its vital rhythms crosses the videographic image, indissolubly linked to the electronic scanning which gene­rates it. A brillant conclusion which, like most aesthetic theories, has left aside the artist and her work. 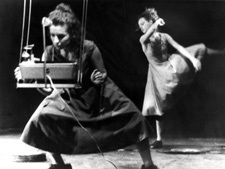 Who would think that the choreographer may assimilate the electronic scanning to her vital rhythms unless she re­ceives an electrical shock on account of an ill connection in a household appliance? I believe that the mistake lies in trying to legitimize the link video/dance through the elements that bind them when such link becomes legitimate in the elements that separate them, forcing them to complement each other. It is said that both means share time: another false coincidence. The time of video is not the same as that of dance: when it is (choreographic registers) in general there is no video dance. The honourable exceptions, as is always the case, will confirm what is not even a rule. The video allows to gather choreographic actions recorded at different times, to eliminate the ties that lead from one bodily posture to another, and, by effect of edition, repeat movements in an identical manner or the other way round, accelerate or extend actions. It turns out to be clearer that the space of video is not that of dance, and another point of our interes may lie there. In video dance, choreographic work is usually done in places that are not conventional for dance, but so is the composition of a virtual space or just the non reference to any space. The eye of the camera allows to rescue zones, sectors that are often bodily and that provide an unusual dimension to the body as a place to go through and/or inhabit. Every bodily aesthectics as a ground to be explored underlies in the close ups or the details that the eye of the camera picks up and the screen raises to our consideration. Because the body, the instrument that is the assumption of the choreographic composition, has never cea­sed to be the protagonist. A body that mediation transforms into surface but that paradoxically seems mo­re immediate, thanks to the approaches of the camera. A body that demands to be treated differently, be­cause the coreographer must no longer design just its movement: he must also design the vision that will go through it. This choreography of the gaze is what perhaps best defines video dance, what gives it its aest­hetic strength and what justifies its raison d'etre within contemporary art. And in spite of all the justifications it finds, it paternity still is problematic. On the one hand, it appears as the unwanted child of video art (at the same time, unwanted child of the visual arts and the video: the lat­ter, in turn, unwanted child of the cinema, etc...) although it is becoming ever more accepted. Dance, on the other hand, seems not have noticed its existence, although it has somewhat indulgingly accepted to house it. If we are aware of the quick acceptance given to other contemporary hybrids (musicals and torture in Latin American countries in Kiss of the Spider Woman, American colonization and Disney's cinematography in Pocahontas), I believe that certain initial resistence is a good sign. 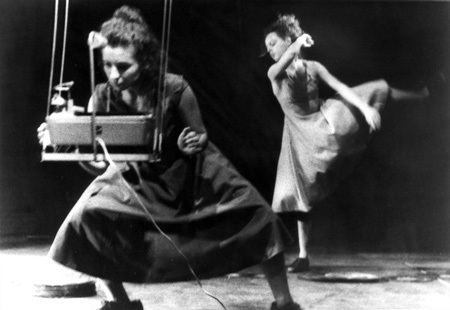 La Hoja del Rojas, VIII, Nº 63, Buenos Aires, 1995; and V Festival Internacional de Video Danza (cat). Buenos Aires: Centro Cultural Ricardo Rojas, 1999.